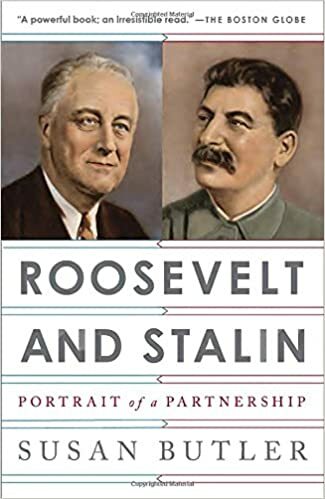 Academic Susan Butler’s Roosevelt and Stalin: Portrait of a Partnership is dense, covering a lot of historical background on how the Allies worked together and prevailed in WWII, the groundwork laid for the United Nations, and the origins of the Cold War and how it possibly could have been avoided had FDR lived another year or longer. But it’s also a compelling read – I often had trouble putting it down and often found myself wanting to quickly pick it back up to find out what came next. The overriding theme of the book is Roosevelt’s deliberate and painstaking efforts to win Stalin’s trust in order to not only achieve victory in the war but to implement his vision of a post-war world order in which the UN would mediate international conflicts to prevent war and eventually facilitate disarmament. Roosevelt was under no illusions that Stalin or the Soviet Union would become the U.S.’s friends, but that the world’s other emerging superpower needed incentive to cooperate with his post-war vision in which all nations could be reined in. In order to achieve his goals, however, FDR would have to navigate a potential minefield of distrust between Britain and Russia as historic imperial rivals, as well as the personal dislike between their leaders. FDR was confident in his ability to serve as a mediator between the two and his confidence turned out to be well-placed. Roosevelt began working his diplomatic skills with Stalin at the Tehran Conference in 1943 and through the Yalta Conference of 1945, including many direct and indirect communications in between. Consequently, Stalin developed a deep respect for the American president, eventually finding him to be fair and trustworthy. Roosevelt was aware that the British had a habit of not keeping their word with Russia and that he could, in contrast, obtain the trust and backing of the Soviet leader with honorable behavior. By 1939, FDR and some of his advisers had recognized the serious threat to world peace that Hitler’s Germany posed. They also realized why Stalin signed the Molotov-Ribbentrop pact with the Nazis, though FDR made a personal appeal to Stalin not to. Stalin was well aware of Hitler’s anti-Slavic views as reflected in Mein Kampf. Along with Jews, Slavs were considered sub-human. Through trade with the U.S., Stalin hoped to obtain materials that might be useful in the event of war with Germany. But however sympathetic FDR might have been on the matter, he faced domestic obstacles that included strong isolationist sentiment and possible accusations of being a communist sympathizer. Lenin still advocated for such a policy in 1921. After his death in 1924, Stalin proceeded to seek official recognition of the Soviet government but didn’t succeed until after Roosevelt took office in 1933. Moreover, after Hitler had taken Austria, Czechoslovakia, and the Sudetenland, Stalin vigorously sought a security pact with Britain and France to counter any potential German aggression. But Prime Minister Chamberlain continually rebuffed such offers. The fact that the British and French elites tended to be fearful of communism and even sympathetic to fascism didn’t help matters. It was also a problem that, in terms of defending border countries, the Polish leadership would not agree to Soviet troops on its soil even in the event of a German invasion. Finally, at the end of July of 1939, diplomats from France and Britain were sent to the Soviet Union, but Chamberlain had them placed on a slow freighter instead of quicker transport that was available. Upon arrival, a further delay occurred when it was realized that the British diplomat did not have documents authorizing him to officially negotiate. When Soviet officials were finally told that Britain had minimal divisions available for potential military operations, revealing serious weakness, the Soviets concluded that Britain was not acting in good faith. It is believed by some that the British leadership didn’t foresee any potential for a pact between Germany and the Soviet Union and felt that the approaching autumn/winter weather would preclude any possibility of a German attack. Thus, the mere appearance of negotiations between Britain and the Soviet Union were thought to be a sufficient deterrent. Meanwhile, FDR saw the decision of Britain and France to not ally with the Soviet Union to counter Germany as a grave miscalculation and thought a war was inevitable. Consequently, he “quietly” signed orders creating military infrastructure that could be utilized for action in the future. He also attempted to persuade key senators to repeal the American Neutrality Act so as to allow transfer of weapons to vulnerable European nations based on diplomatic information from Belgium that such a move would make Hitler think twice about further aggression. But he was unsuccessful in those efforts. Sensing the futility of his attempts to ally with Britain and France, Stalin fired the pro-British Maxim Litvinov as Foreign Minister and appointed Molotov who was more sympathetic to Germany. Stalin also knew that as the Soviet official who was by far the closest to him, he would get more detailed reports of negotiations from Molotov. Talks on trade with Germany were eventually begun and those on political issues soon followed. When Stalin signed the pact with Germany on August 24, 1939, he believed that he was buying time to prepare for any invasion. He clung to the delusion that Germany would seek to take out Britain first and Hitler intentionally gave that impression. Stalin’s denial in the face of continual warnings of an imminent German attack from his own generals and multiple intelligence and diplomatic sources, including information passed on to the Soviet Ambassador from the U.S. State Department, which had surreptitiously obtained a copy of Hitler’s Directive for Operation Barbarossa, is simply mind-boggling. Due to pressure from General Georgi Zhukov and Semyon Timoshenko, Stalin agreed to some modest defensive preparations. But he was so convinced that Germany would not yet attack the Soviet Union that he even granted a German request to search for bodies of German soldiers who’d died in WWI in Russia. Zhukov and Timoshenko were flabbergasted at this blatant attempt to survey Russian military positions and troop levels. Stalin’s justification was that he was appeasing Germany to avoid giving it a pretext for an early attack. “Beginning at 3:15 on the morning of June 22 three million German soldiers, plus another half million Romanian, Finnish, Hungarian, Italian and Croat troops, coordinating their attack from the Finnish border to the Black Sea, equipped with 700,000 field guns –some marching on foot, some riding in one of 3,600 tanks or one of the 600,000 motor vehicles, some mounted on one of the 600,000 horses – spilled over the Soviet western border. Over their heads flew 500 bombers, 270 dive-bombers, and 480 fighters. “Because the Germans, using various pretexts, had been allowed to fly reconnaissance missions over the Russian border and had checked out the airfields, army bases, and command centers for the better part of a year, the Luftwaffe easily and quickly found its targets; the immediate devastation was huge: twelve hundred Soviet planes were lost the first day. The commander of the western front’s air forces was so stunned he committed suicide…. It took several days for the profound error in judgment he’d made to sink into Stalin, during which he retreated to his dacha, drank heavily, and reportedly suffered a nervous breakdown. Molotov was forced to give the first post-invasion speech to the Soviet population. When finally Molotov, Beria – the head of the NKVD (precursor to the KGB) – and another Soviet official entered his dacha, Stalin feared they had come to arrest him. Upon realizing that they had not come to depose him but expected him to assume his duties as the Soviet leader, he managed to pull himself together. Stalin proceeded to put in 18-hour days and got himself quickly up to speed on all relevant military and logistical matters. He immediately made efforts to reach out to the U.S. and Britain for an alliance. By mid-September, however, Kiev had been captured and over 400,000 Soviet soldiers taken prisoner after which they were held in open air fields where they were shot or allowed to starve or die from exposure. Everyone has heard of the infamous Siege of Leningrad. However, in September of 1941, the siege of Moscow began and would kill 926,000 before ending. By the middle of the month, Stalin was forced to order the evacuation of the city. In early November the anniversary of the 1917 revolution was coming up, which was normally commemorated with an elaborate celebration in the capital. Stalin decided to hold the traditional march in Red Square with a military parade. Molotov and Beria were incredulous at the idea. “The war is won,” a Red Army colonel said to him as they stood at a railway station east of Moscow…. By November 23rd things were looking extremely grim as German soldiers were close enough to see the highest points of the capital city and Russian officials had asked British diplomats for help in destroying the oil wells in the Caucasus. Then something fateful happened: the temperature dropped to -4 F. German soldiers weren’t prepared for the Russian winter, their leaders assuming they would have captured Moscow well before then. At this point, General Zhukov was finally able to mount a successful counter-attack and go on the offensive. Moscow then handed the Wehrmacht its first major defeat. FDR appointed Sumner Welles as Under Secretary of State to lead a reorganization of the department’s staff. But the results were less than successful and FDR was forced to find ways to circumvent the stonewalling he encountered within the State Department and other agencies when trying to implement policies to assist the Soviet Union. For the time being, FDR had to work with Harry Hopkins to expand the Lend-Lease program to provide direct assistance as quickly as possible to the Soviet defense. Hopkins convinced FDR to let him go to Moscow as soon as possible for a direct meeting with Soviet officials. Hopkins subsequently had a 2-hour meeting with Stalin to coordinate assistance. During this meeting the Soviet leader said he would allow American troops to operate in any part of Russia under American command if they were willing to do so. Roosevelt still encountered attempts to sabotage his robust efforts to supply the Soviet Union lower down the chain of his administration. Nevertheless, by the fall, the Lend-Lease program and the “Moscow Protocol” were providing “massive” supplies to Russia in the fight against Germany. FDR also felt he had to come up with ways to prevent any senior military officials from working to oppose his plans. For example, the Map Room was set up for important diplomatic messages to be passed and military information to be tracked via charts and maps displayed on the walls. Only FDR, Hopkins and Admiral Leahy were allowed access to this room outside of the staff of code officers and 6 watch officers – 3 from the army and 3 from the navy. To prevent any military officials from knowing his complete correspondence with Churchill, Stalin and Chiang Kai-Shek, incoming messages were relayed through the War Department and outgoing messages through the Navy Department. After the attack on Pearl Harbor, the Roosevelt administration faced few domestic political obstacles to any military assistance against the axis powers. In early 1942, discussions were underway for a cross-channel attack on Germany the following year, opening up a western front in Europe. The plan was known as Operation Overlord and was supported by most of the American military leadership, including Secretary of War Stimson, General Marshall and Eisenhower who was then a colonel/brigadier-general. Eisenhower drafted the plan for spring of 1943. However, British cooperation was necessary and Churchill argued for delay of the plan as the Joint Chiefs of Staff knew he would. Churchill’s main delaying tactic was to argue for a diversion of troops to capture islands in the Mediterranean, a further push into Italy, and increasing supplies to “partisans” in the Balkans in the hope of provoking a Balkans split from Germany thereby pushing Turkey into the war. None of the other allied political or military leaders were convinced of the feasibility of Churchill’s plan, but his opposition to Overlord prevented its implementation at that time. It was only at the Tehran Conference at the end of 1943 that Churchill begrudgingly agreed to the operation. After being talked out of opening the second front in Europe in 1942, FDR went into North Africa. By the time of the Tehran Conference in December of 1943, indirect communications were being conducted regularly between FDR and Stalin via diplomatic personnel and cables back and forth. The nature of these contacts made Stalin realize that the Soviet Union was being viewed as an equal. As a result of concerns communicated that would smooth the way for productive negotiations at Tehran and the basis for a quid pro quo relationship, Stalin began to allow for some freedom of religion in the Soviet Union and he dissolved the Comintern. The concession on religion came about due to FDR’s suggestion that to do so would quell domestic criticism about assisting the Soviet Union. Furthermore, Stalin was already inclined to dissolve the Comintern due to a belief that each nation should have its own communist party and it was not the Soviet Union’s responsibility to export revolution. In addition, some of the duties of the Comintern could be reassigned to other Soviet agencies. FDR turned down Churchill’s offer to let him stay at the British embassy in Tehran for the conference, instead he “charmed” Stalin into inviting him to stay at the Russian embassy. On the day of his arrival, FDR had the first of three meetings with Stalin without Churchill. FDR, of course, was deliberately keeping Churchill at arm’s length in order to begin his plan to gain Stalin’s trust and cooperation by building a rapport. Naturally, Churchill resented such treatment by the American president. The first meeting lasted around 40 minutes. China, colonialism, mutual dislike of the French leadership, opening up a western front, and Stalin’s wish to become a post-war trading partner with the U.S. were all discussed to varying degrees. Of course, Stalin had his match in FDR whom associates described as being a quick study even when it came to complicated matters, possessing remarkable listening skills, mastery of detail, and ability to switch gears from one issue to another. It became clear to FDR during their conversations that Stalin had to be convinced of any post-war order being able to block the resurgence of Germany, which Stalin believed would be able to rebuild within a generation unless prevented from doing so. Stalin was not initially persuaded by FDR’s idea of the UN being able to accomplish this. Moreover, Stalin was skeptical of China as one of the four policeman. FDR, however, believed that China’s population alone meant that it would eventually become a serious power. Additionally, he believed that a non-white nation must be represented on the Security Council and that China could balance out the Soviet Union’s power in Eurasia. During the third meeting, the UN was discussed further as well as Poland and the Baltics. Roosevelt was willing to accept Soviet control of Poland as long as it was “peaceful and its institutions preserved.” FDR and Harriman acknowledged that the UK-recognized Polish government-in-exile was problematic in terms of its leaders tendency to be strident and Russophobic in addition to expecting the U.S. and UK to “restore their position and their landed properties, which were extensive, and prop up the feudalistic system that had existed in Poland earlier in the century.” (p. 124) Mindful of domestic politics in an upcoming election year, FDR did not discuss borders at the conference in order not to upset Polish-Americans. He did, however, show openness to the idea of ceding Polish territory in the east to the Soviets and adding German territory in the west as compensation. As far as the Baltics, FDR initially wanted them to be independent but eventually gave up that request. Roosevelt got Stalin to agree to the UN as a universal global organization rather than having regional bodies in return for Soviet Control of Poland and the Baltics. By the time of the Yalta Conference in February of 1945, the Polish question would be worked out in more detail. By then, the Red Army had pushed the Germans out of Poland and Stalin had established the Polish Committee of National Liberation (PCNL) to govern. At Yalta, Stalin and Churchill butted heads on the issue. Not only had Stalin personally seen Russia’s vulnerability to attack and invasion during the Russo-Japanese war, WWI and WWII, he had a library containing more than 20,000 books on history and political theory, many of them with heavy personal annotation. Protecting Russia’s future security with all the resources at his disposal was one of two top priorities for Stalin after the war ended. This had everything to do with his attitude toward Poland. FDR supported the removal of anti-Russian elements in any future Polish government and developed a rapport with the leader of the Polish Peasant Party who favored amiable relations with the Soviet Union as a possible solution. But the leadership of the Polish Peasant Party was unable to secure significant support from the émigré community to agree to certain conditions. Consequently, the Party was unable to successfully work with the Soviet-sponsored PCNL, cementing FDR’s resignation on Poland that it simply be allowed the outward trappings of “free and fair” elections. However, Churchill was a virulent racist and believed whole-heartedly in the colonial system. The most infamous example of this thinking by Churchill was his attitude toward and actions against the Indians whom he had once referred to as “pernicious vermin.” During the war, Churchill had knowingly set in motion policies that led to massive starvation in the Bengal region. As word got out of the genocidal levels of the enforced famine, offers of food aid were made by the U.S., the House of Commons voted to take steps to alleviate the starving, and appeals were made by the local viceroy and the Archbishop of Canterbury. All of these were actively blocked and ignored by Churchill, leading to an ultimate death toll that reached into the millions. Churchill’s cynicism about FDR’s motives were reflected in his belief that moral and practical opposition to colonialism/imperialism were not possible and that FDR merely wanted the colonies of Britain to be released so they could then become dependent politically and economically on the U.S.
FDR was ultimately able to get Churchill to allow India to sign on separately to the UN. In preparation for the conference, FDR had his ambassador Averill Harriman communicate the issues he most wanted to discuss to FM Molotov and Soviet ambassador Maisky: In addition to the future of international security (UN), FDR had wanted to resolve the issues surrounding Germany, namely reparations and partitioning. Partition of post-war Germany into 4 or more sections was discussed, with the possibility of Britain and even France presiding over areas being entertained. In the end, it was divided between the U.S.(later under a more general U.S.-led western/NATO umbrella) and the Soviet Union. After the allied victory in Europe, FDR and Stalin began working out how the Soviet Union would contribute to the war against Japan. U.S. military leaders were keen on getting Soviet assistance in order to decrease the number of American casualties in the planned invasion of Japan’s main islands. Previous experience fighting the Japanese saw a 98% death rate for Japanese soldiers who would fight to the death rather than surrender. In a series of memos from the Joint Chiefs of Staff to FDR on this subject, the JCOS suggested that Stalin be asked what steps should be taken to best facilitate quick and effective collaboration between the U.S. and Soviet Union and to provide feedback on any prior problems with the U.S. that had been observed by Soviet officials that could hamper such an effort. The joint military action to take out Japan was expected to be relatively quick with Stalin offering the use of the largest army in the world. Allied intelligence would, in fact, reveal that the entry of the Soviet Union into the war against Japan would push the latter to surrender. In return, Stalin wanted the return of the Kurile Islands which it had lost to Japan in 1875 and territory lost in the 1905 war, as well as control of a couple of ports. Return of the Kuriles was eventually agreed upon, along with the southern portion of Sakhalan and an internationalized free warm water port at Dairen, the use of which was to be shared with China. By the time of the Yalta conference, there had been much discussion within the Roosevelt administration about the advantages and disadvantages of revealing to the Soviet Union the existence of the program to build the bomb. By 1940, Soviet officials had already developed suspicions based on the sudden absence of any discussion of nuclear fission in American physics journals and the simultaneous disappearance of top physicists from academia. The Soviet Union had started a program, but with the invasion of Germany, resources were diverted to other more immediate needs and it was not restarted until after the defeat of the Nazis. Early on, FDR struggled with whether to share information with his Soviet ally. The question was not only over whether to reveal the existence of the program but how much information to share. After receiving feedback from relevant scientific and military leaders, there was majority opinion that the Soviet Union should be informed. The reasoning that underscored this opinion was that the Soviet Union would likely be able to build their own such weapon within a matter of a few years and if no moves toward openness about the existence of such a weapon on the American side had been made, the anger and distrust would make a dangerous arms race inevitable. Roosevelt was inclined to follow this advice, but Churchill was again the spoiler, persuading FDR in September of 1944 to hold off on revealing the program at that time. With advisers suggesting that a successful detonation would not occur until spring, it is believed that FDR thought that a delay in sharing the information with the Soviet Union until then made sense. By the time of the Yalta Conference, of course, this had not happened. Even by the time of FDR’s death, it had not happened. Unfortunately, Harry Truman did not have FDR’s understanding of the nuances of the international arena or the Soviet Union’s security concerns, much less his diplomatic skills. Truman ordered the leaders of the Manhattan Project to push the testing of the bomb up so he could use it as leverage at the Potsdam Conference. He also refused counsel from many more knowledgeable and wiser individuals who had been part of the Roosevelt administration. Instead, Truman was more comfortable taking advice from those who confirmed his own “gut” feelings on matters. He therefore listened to more conservative and anti-Russian voices, like Leslie Groves. Unfortunately, FDR did not live long enough to attend the UN Conference that April. Some believe that he intended to step down as president after the war’s end and serve as the organization’s first Secretary General. By the time of the conference, there were still a few issues to be ironed out between the two superpowers. The first was the Soviet position on the scope of a veto as a Security Council member. The Soviets, who believed that as the only Communist member (Stalin did not view China’s communists as genuine) they could be ganged up on, wanted the veto to extend beyond actions to also cover discussion of particular issues. This position was a non-starter for the U.S. Furthermore, Truman had been dismissive of Molotov during his first meeting with the Soviet FM and made comments that seemed to indicate a backtracking of what had been agreed to at Yalta on the Polish issue. During the UN conference, Hopkins had to fly to Moscow to assuage Stalin’s growing concerns about the attitude of the president after he ordered the immediate halt of Lend-Lease – an order he quickly reversed after being advised of its irresponsibility. Stalin also wanted the Soviet republics of Belorussia and Ukraine to have separate votes in what would become the General Assembly. Doing so, especially in the case of Ukraine, would give Stalin a domestic boost. After a series of six meetings with Hopkins, Stalin finally relented on the veto issue and reiterated his promise to enter the war against Japan. He also would later get agreement on the two Soviet republics. Supposedly Stalin signed the declaration in the belief that the Soviet Union’s influence on the governments of eastern Europe would be, at a minimum, tolerated due to the Red Army’s contribution to their liberation and the assumed success of communist parties in free elections. Not to mention, Stalin wanted to maintain good relations with the U.S. in the hopes of economic assistance. But under the Truman administration, relations continued to deteriorate and a “cold war” emerged. …..late than never reading this one. It is a darn good thing that we have President Putin now, as he is the only true statesman around these days holding everything together. Peace. PS: I love your site’s masthead. Thank you.